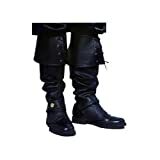 These are boot TOPS – Not boots, but designed to go over your regular shoes and give the “appearance” of boots. These Prestige Deluxe Vinyl Boot tops are designed to go over your own black shoes! The Boot Tops looked great. Got a lot of compliments. There were two things that need to be improved. First, the straps that go under the shoes were too small. Easy fix with added elastic and velcro. Second, when walking the tops fell to your shoes. There is not enough rigidity to hold them up. I fixed with an elastic band just below each knee, that I anchored with velcro to the inner panel. Looked good but you need to find a way to hold it up. Otherwise the covers will just fall down. I used Velcro strips attached from the inner top of the boot cover to my pant legs. These boot tops are very well made but it took some time for me to get them to work right. I cannot stress enough how well these things look. Everyone at the party thought they were complete boots. I will tell you what I found so you won’t have to go through the hassles. The boots will flop down towards your ankles if not held up with something since they are soft vinyl. I tried safety pins to hold them to my pant legs but these kept opening up. I finally put two stitches with needle and thread from each side of the boot top to the pant legs and it kept them up all night. I have thought of using some kind of cardboard insert next time I use them, but the stitch thing worked nicely. Also, there is a right and left side boot which I found out after putting them on and stitching them in place. They have two golden buttons around the ankle, which go on the outside of the boot. In my case I had to cut the threads, put them on right and then re-stitch them in place. Finally, I had laced shoes and these things work much better with loafers. The bottom of the boot has two elastic straps and no instructions on how to put them on. I found out the rear most strap goes on the bottom of the shoe between the sole and the heel. The front strap goes on better over the top of the shoe and not under it. It was easier to put the shoe through the strap first then put the boot on like it was a regular boot. Tying the laces was not easy once these are on, so I recommend you use loafers instead. 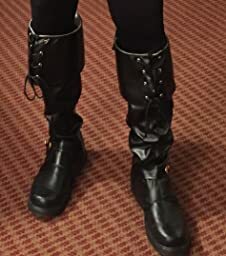 Despite the adjustments I had to make, the boots looked great and I recommend them to anyone, unless you are not handy with a needle and thread. These were a hit at the party.